Historically, the Nissan Altima’s strength, when compared to other midsize sedans, has been its responsive handling, and I’m happy to report that the trait remains intact with the 2015 model. The 2015 Nissan Altima excels at handling, fuel economy, technology and comfort, but lacks the fire that previous Altimas ignited. 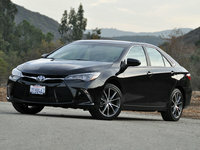 Still, it’s a very good all-around family sedan with plenty of talent to keep you engaged. I remember the introduction of the 2002 Nissan Altima like it was yesterday; it shook the midsize family sedan market from the ground up and revived Nissan’s fortunes like a shot of double espresso. It was a groundbreaking design, modern and bold, yet classically appealing at the same time. Back then, the new Altima truly stood out amongst its bland competition and in sharp contrast to the almost invisible Altima it had replaced. Not only that, it was roomy and comfortable, with simple instrumentation similar to that of a sports car. Finally, it was a blast to drive. I still see tons of these third-generation 2002-2006 Altimas on the road, and when lovingly maintained they look like they could be brand-new designs rather than shapes penned over a decade ago. Nissan set the bar high with this one, so high that it may have been detrimental overall. Successive Altimas haven’t created as big a splash, and while the latest iteration of Nissan’s family sedan, which debuted in 2013, is an appealing sedan, it appears that the company relies too heavily on busy details and heavy-handed applications of chrome in an effort to make it stand out. In my opinion, Nissan has copied too many details from the range-topping Maxima, which today relies on rental-car companies far more than consumers to keep the assembly line running. Remember when Maximas used to be cool? I guess I just dated myself. Choosing an Altima isn’t as easy as it ought to be. Altima 2.5 models have a 4-cylinder engine, and Altima 3.5 models have a V6 engine, and while they share trim levels (except for a stripped-down 2.5 base model that dealers stock in order to advertise a lower price), the trim levels don’t match in terms of equipment. That means a 2.5 S, SV or SL is not as well equipped as a 3.5 S, SV or SL. My advice? Decide which engine you want, and then compare from there. My test vehicle is one of the most popular versions of the car, an Altima 2.5 SV. By upgrading to SV trim, you’ll get 17-inch aluminum wheels, fog lights and NissanConnect technology with Mobile Apps, a hands-free text-messaging assistant, a USB port, satellite radio and a reversing camera. The SV also adds dual-zone automatic climate control, an 8-way power driver’s seat with power lumbar support, a leather-wrapped steering wheel and remote engine start. 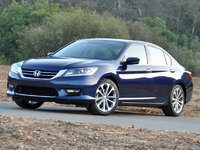 To this, my test car added the Convenience Package and the Technology Package, bringing the price to just over $28,000. The Convenience Package ($1,350) includes a power sunroof, an auto-dimming rear-view mirror with a compass, a HomeLink universal garage door opener, a small cargo net for the side of the trunk, interior mood lighting and LED turn signal indicators on the outside mirrors. But I think the most useful thing about this upgrade are the rear-seat air conditioning vents. The Technology Package ($1,090) is a real bargain, considering what it adds to the Altima 2.5 SV. 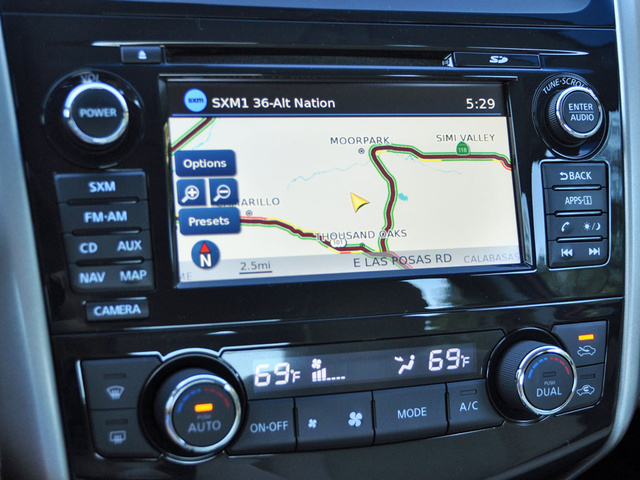 A 7-inch NissanConnect screen replaces the standard 5-inch screen and includes voice recognition, SiriusXM traffic and Travel Link services. More important, this package installs a blind-spot monitoring system, a lane-departure warning system and a Moving Object Detection system that monitors for approaching cross traffic when the Altima is reversing out of a parking space. Swathed in Cayenne Red paint, my Altima 2.5 SV was good looking enough, but it definitely lacks the va-va-voom appeal of sleeker and better-proportioned sedans like the Mazda6 and the Chrysler 200. At least no one can argue with the styling of the cabin. Thanks to its two-tone color scheme, it looks upscale, and most of the materials are of good quality. 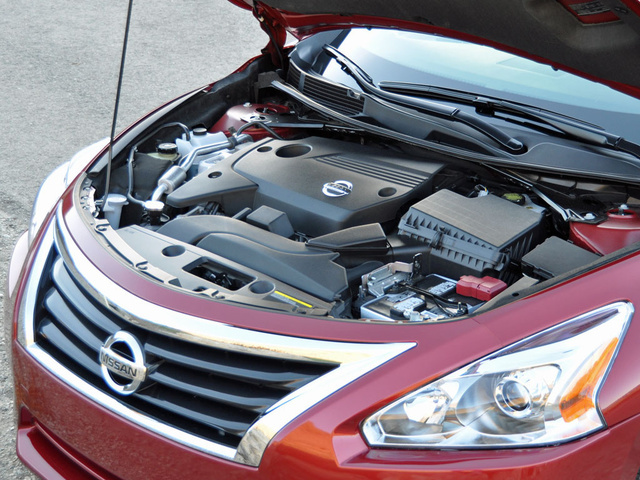 Pop the hood of an Altima 2.5 to reveal a 2.5-liter 4-cylinder engine rated to make 182 horsepower. This is a lively and spirited powerplant at all points across the rev range, thanks in part to a standard and remarkably refined continuously variable transmission (CVT). 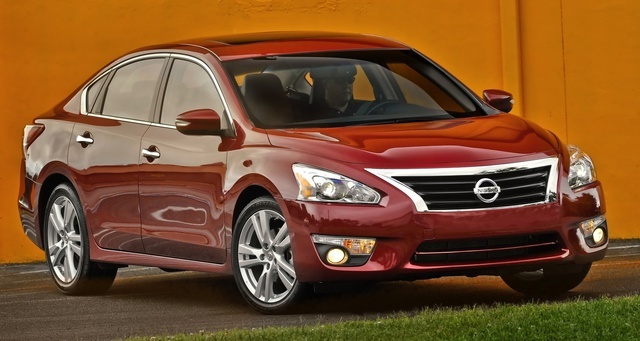 It works quietly and swiftly to deliver the engine’s power to the Altima’s front wheels. Independent publications have clocked this vehicle getting to 60 mph in less than 8 seconds, which is quite good for this class. Spend too much time exploring this aspect of the car’s performance, and you won’t come close to hitting EPA fuel-economy estimates of 27 mpg city/38 highway. During my week of relatively moderate driving I averaged 27.8 mpg in combined driving, which is less than the 31-mpg rating the EPA led me to expect. Historically, the Nissan Altima’s strength, when compared to other midsize sedans, has been its responsive handling, and I’m happy to report that the trait remains intact with the 2015 model. Even though Nissan no longer offers the sport-tuned SE trim of years past, the 2.5 SV delivered driver satisfaction on curvy roads, dutifully obeying every command with nary a protest. You can toss this Altima through a hairpin corner and it bounces right back, ready for more. While I thought the Altima’s steering was reasonably crisp and direct, my husband contends that this electric steering rack is one of the least satisfying modern setups that he’s sampled. The Altima’s brakes proved strong and easy to modulate, and the suspension virtually eliminated body roll and other untoward movements, though it definitely feels firm. As a result, I find the Altima 2.5 a pleasure to drive on sinuous roads, as well as comfortable and serene on city streets, all the while while maintaining an impressive air of quietude inside the cabin. 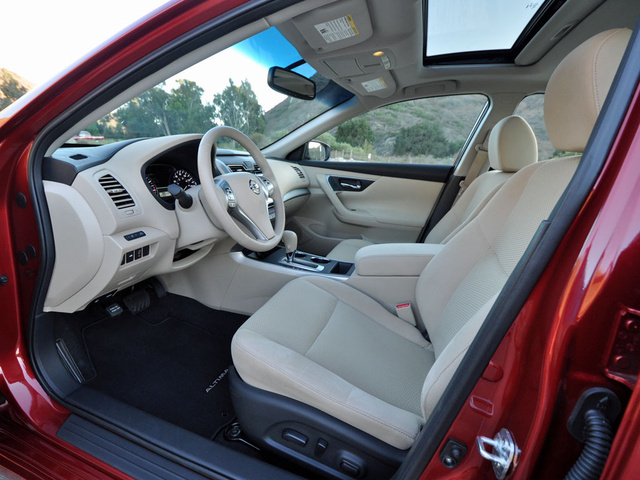 Nissan uses what the company calls Zero Gravity seat designs for the Altima’s front seats. They adopted the technology from NASA to find the most comfortable, least fatiguing positions for the driver and front passenger. All I can tell you is that these are indeed comfortable, and even after a long day of trudging around Disneyland on an offensively hot day, it was gratifying to sink into these seats. 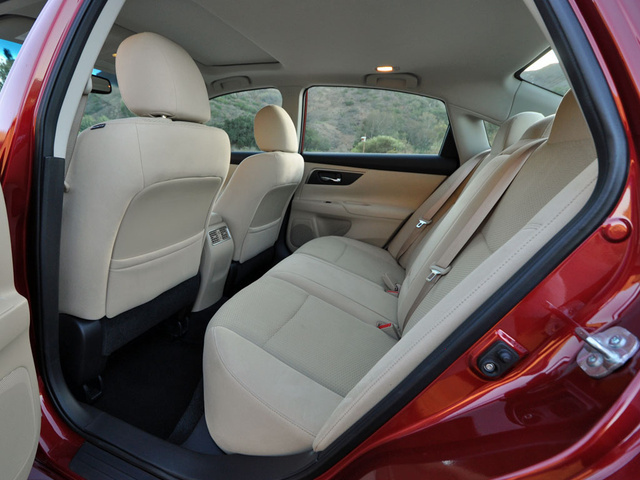 Adult rear passengers also found the rear seats to be exceptionally comfortable and roomy, with what seemed like limitless space. Most of the time, though, I carried my young children in this car. If you’re like me and plan to use the Altima as a kid carrier, I’d recommend skipping the beige cloth seats. They show everything. Beyond seat comfort, the rest of the Altima’s cabin is agreeable, exhibiting impressive levels of fit and finish rendered in materials that feel like quality and are pleasing to the touch. Controls are very clearly marked, and all systems are easy and intuitive to use. The Altima also provides 15.4 cubic feet of cargo space in the trunk, and the SV model’s side-mounted cargo net is perfect for carrying jugs of milk, bottles of juice, or Pinot Grigio for mommy’s weekend fling. The 60/40-split rear seats also fold for greater flexibility. My Altima 2.5 SV test vehicle was equipped with all the technology you need, and nothing you don’t. From an Advanced Drive Assist Display, which displays pertinent information front-and-center in order to minimize distractions, and NissanConnect technology to several useful safety features, my affordable Altima had it all. The optional Technology Package upgrades the NissanConnect screen to a larger size, and it really makes a big difference in terms of usability. Flanked by traditional knobs and buttons designed to control traditional functions, the screen features large touch-sensitive virtual buttons, clean graphics and legible markings, and it proves quite intuitive. Equipped with navigation, traffic and weather information, and the ability to sync a smartphone for all the latest in social media and entertainment, along with text-messaging support and more, NissanConnect is impressively executed except for the amount of glare the screen sometimes suffers. Equipped with a 5-star overall crash-test rating from the National Highway Traffic Safety Administration (NHTSA) and a Top Safety Pick rating from the Insurance Institute for Highway Safety (IIHS), the Altima sure is able to protect its occupants in a collision. But what does it do to help avoid one in the first place? One thoughtful feature is the standard Easy Fill Tire Alert system. When the tire pressure monitoring system tells you that a tire is going soft, drive to the nearest gas station with an air hose, unscrew the tire cap, and pump air until the horn chirps. That tells you that you’ve reached the proper tire pressure and that you’re done. Thanks to this system, Nissan makes it easy for Altima owners to maintain proper tire pressure, which is critically important to overall vehicle safety. No more futzing around with a pressure gauge to see if you’re still too low or you’ve gone too high. Beyond this, most Altimas have smart automatic headlights that are linked to the windshield wipers. Turn the wipers on, and after several swipes the headlights will illuminate, helping to make the Altima more visible in the rain or during snowstorms. A reversing camera is also included on most models. Beyond these features, the Altima 2.5 SV and 2.5 SL can be optioned with blind-spot monitoring, a lane-departure warning system and a Moving Object Detection system. All three technologies are standard in the 3.5 SV and 3.5 SL, and it’s worth noting that Nissan expanded availability of these systems to the SV models just this year. If you’re the type of person who automatically assumes that Japanese cars are more reliable, you’re going to want to investigate the Altima’s historical ratings before taking the plunge. Consumer Reports isn’t terribly impressed, and neither is J.D. Power. 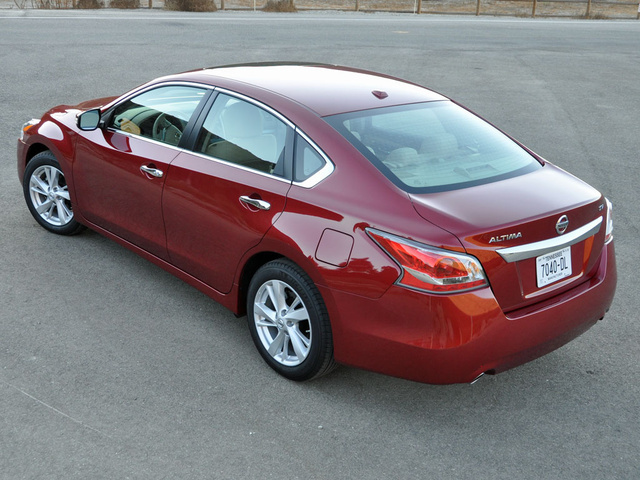 The Altima’s quality, dependability and reliability ratings all trend as average. That describes the Altima’s ability to hold its value over time, too, as well as expected costs associated with long-term ownership. My observed fuel economy number of 27.8 mpg, though impressive compared to other midsize sedans, falls short in terms of how it matches up to EPA ratings, adding another layer of “meh” to the Altima. That’s probably why Nissan offers killer deals on the Altima, pretty much all the time. As I write this, there are zero-down lease deals, zero-percent financing deals and up to $1,750 in rebates. Whatever you do, don’t pay more than invoice price for an Altima. In fact, subtract whatever rebate is available from the invoice price, and don’t pay more than that. 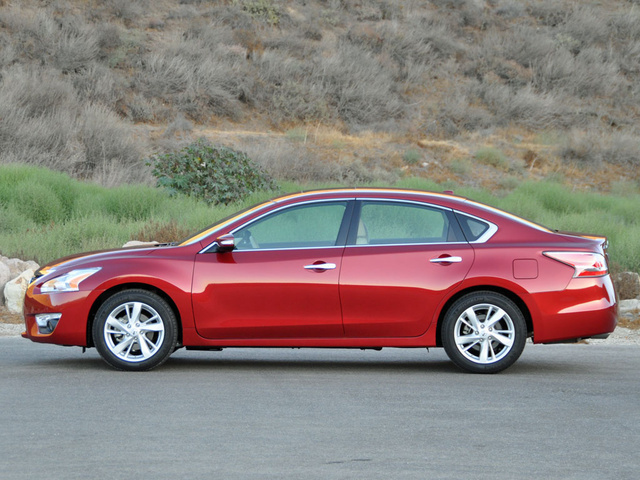 What's your take on the 2015 Nissan Altima? mchan1 Comparison to competitors' models and from an older 2005 Altima S: 1. The 5" radio display is NOT the Touchscreen version. 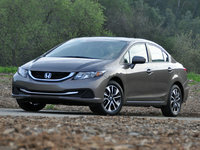 - Many competitors' models INCLUDE a Touchscreen radio! ... Nissan =/= Newer Technology = Outdated technology! 2. Rear headrests STILL are NOT adjustable when their competitors' models ARE adjustable 3. Side mirrors a. Are NOT Foldable unless you buy the top line SL trim b. Not sure about 2015 since it's not mentioned (currently) but NO heated side mirrors considering the cost and that many of the competitors' models include them, at least on the mid to top trim models 4. NVH.. Noise, Vibration, Harshness - It's STILL relatively LOUD!! a. CVT engine drone upon start up and acceleration - Honda/Toyota both have CVT but THEY managed to REDUCE the noise level in their CVT engines b. Road/Tire noise is LOUD! - Has been that way since early 2000 models (used to own 2005 Altima S >10 yrs) and it's STILL LOUD! - Part of the problem is the usage of Continental Tires... the ones used are rated as low resistance tires... some owners online have rated the 2013/4 (as 2015 are new) models are BAD in snow and LOUD! --- Nissan is STILL using the Cr@ppy Continental Tires instead of ones from Dunlop, Cooper, Good Year, Bridgestone or Michelin! 5. Fuel economy stinks for stop and go traffic. - The 2014's engine (basically unchanged generally for 2015) gives ~23mpg city, ~33hwy and ~26 mixed. --- That's BELOW what Nissan had advertised and what the government tested shows >:( --- Now.. still breaking in engine ~1000 miles but hopefully the fuel economy improves over time! --- The car's engine NEEDS... NO... MUST be broken in.. Properly! How? ------ Based on my experience with the older 2005 Altima, the driver NEEDS to drive the car LONG-DISTANCE!! ------ The older engine got mpg of ~23 city and 27 hwy with 25 mixed BUT during the winter... ~18 city and 26 hwy and 23 mixed! ----- Basically, the car SUX in cold weather driving!!! --- Hoping that the newer 2014 engine is Better due to the engine's advanced technology >10 years! 6. Zero Gravity seats... - Nothing but Marketing BS! - Either you like it or you don't! -- FYI... sit on the cloth seats then the leather seats... the cloth seats has MORE seat button cushion (bounce). -- The lumbar support used to be standard on the older "S" trims and up. 7. Cupholders... - Where's the side grips to hold the cups/bottles/cans that other competitors' models have? - The middle console sizes are smaller and doesn't accommodate larger bottles. Even the newer competitors' models INCLUDE some of the features missing as STANDARD equipment either across the board on ALL their models or starting from the Mid to top trim whereas as the Nissan Altima does NOT! "Whatever you do, don’t pay more than invoice price for an Altima. In fact, subtract whatever rebate is available from the invoice price, and don’t pay more than that." ^ Pretty much says it all!! Nissan cuts corners and you can tell esp. if you were an owner on one of its older cars as you KNOW what you're looking for so can tell the difference! It's pricey as Heck for things you DON'T get! Either Nissan starts including the "missing/smaller features" that its competitors' models include as STANDARD equipment or it's time to DUMP the Altima, if not Nissan, probably forever! Users ranked 2015 Nissan Altima against other cars which they drove/owned. Each ranking was based on 9 categories. Here is the summary of top rankings. 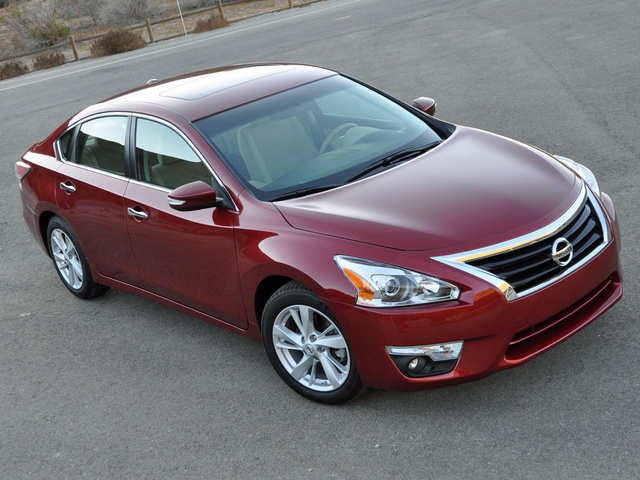 Have you driven a 2015 Nissan Altima?